​Back in June, I had the opportunity to shadow PennDOT Secretary Leslie S. Richards for the day. 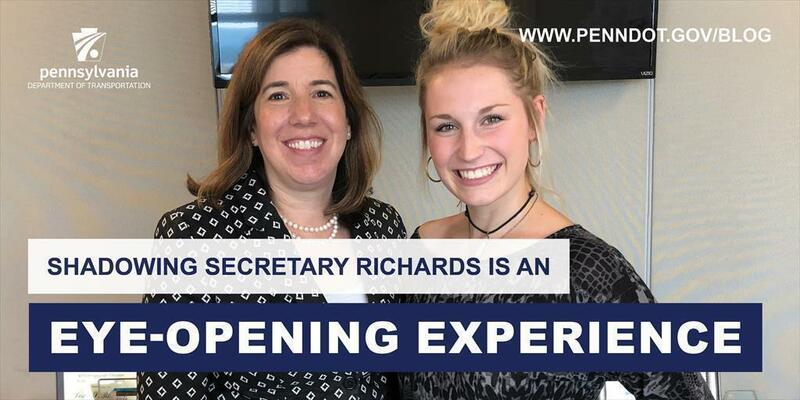 It was an amazing experience to be able to follow Secretary Richards and see what her job incorporates daily. She is a very busy woman and is constantly on the go to see and meet new people every day. PennDOT Secretary Leslie S. Richards, who is also chairwoman of the Pennsylvania Turnpike Commission, spoke at the Turnpike's meeting of the Women's Resource Network. Secretary Richards stresses how important women’s roles are in the work place. Therefore, our first stop was the Pennsylvania Turnpike Commission to help launch its Women's Resource Network, which aims to provide a place at the PTC for women to have the chance to develop their professional careers by providing opportunities to connect, mobilize, network, and participate in mentoring activities all while supporting work-life balance. Richards, who also is chairwoman of the Turnpike Commission, introduced herself to employees and shared her journey to where she is now. Our next stop was attending a meeting with representatives from the New York State Department of Transportation to discuss salt improvements, how to start planning for this coming winter, and the future of automated vehicles. The topics were very interesting, and it was great to see states working together in hopes of specific improvements coming soon. All in all, I was very fortunate to have the opportunity to shadow Secretary Richards for a day. I learned so much in the amount of time that I could spend with her. Ellerie Krot is student at Shippensburg University studying public relations. She is a summer intern with the Pennsylvania Department of Transportation’s central press office.